Many teachers around the country spend the first part of the school year reviewing or teaching basic science skills. 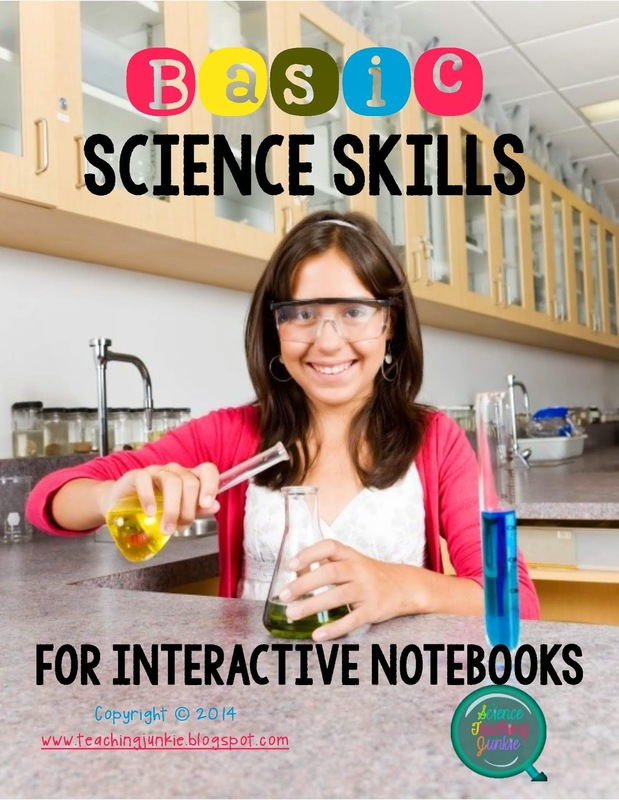 If you're looking for a way to incorporate this content into Interactive Science Notebooks, this product is just what you need. Having it affixed to the interactive notebook also allows students to refer back to these very important skills and concepts throughout the year as they are putting them to use during labs, activities, and investigations. Click on the product image above to be taken directly to my store. 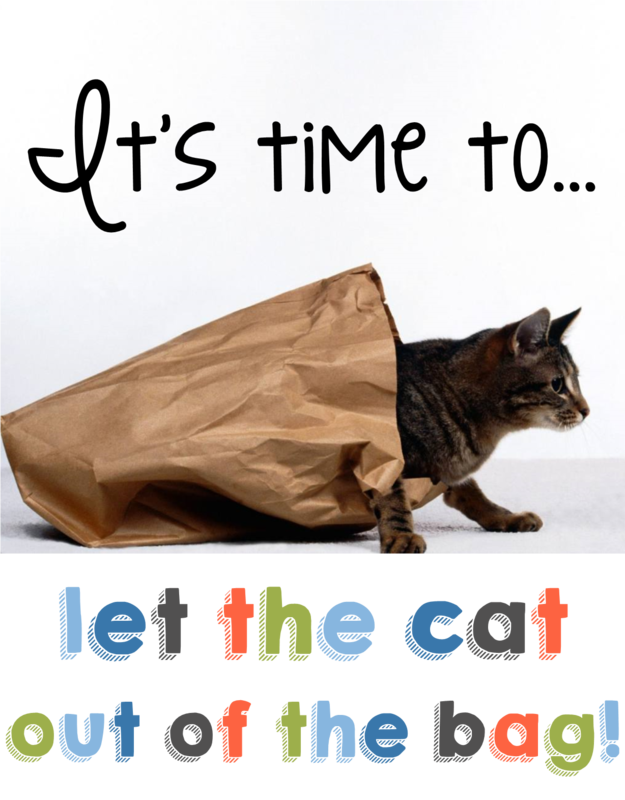 I gave you a little tease the other day, but I figured it was about time to "let the cat out of the bag." I still need to do a post about my amaze-balls trip to Vegas for the Teachers Pay Teachers Conference, but one of the big ideas in my head as I traveled home was that I needed to help find a voice for the middle school educator. On the internet, there are a plethora of resources for elementary education (in fact, there's a ton, to put it mildly). But why aren't there many resources for secondary teachers? In the middle grades, we deal with a strange bunch of kiddos. Things geared towards K-4 are often too childish and would be considered completely irrelevant to the average middle schooler. But at the same time, high school materials are too advanced or lack the aesthetic qualities that would excite or grab the attention of a middle schooler. I would love to see secondary teachers join together and start sharing their ideas and resources. I will admit that for many years, I preferred to just close my door and teach my class the way I wanted to teach it. I didn't need/want anyone's help and I certainly didn't want to just hand over the resources I had spent countless hours creating to my neighboring teachers. I was very much an island and I liked it. A few years ago, my school made a BIG move to collaborative planning. The expectation is that every same subject, same grade level teacher is on the same page. Which means we plan together daily, teach the same content, administer the same assessments, and share our ideas to come to a mutual agreement on what's best for ALL of our students. I'm not gonna lie and tell you that things were hunky-dory at first - because they weren't! But, with the right teacher pairing, collaborative planning can be amazing! One of the best parts about collaborative planning is the sharing of ideas. You may think you know it all and have THE BEST lesson for your students, but let's face it... students are changing and there are a lot of teachers out there who have innovative ideas. So why not tap into this wealth of information? Why spend all of your free time creating new lessons and activities for your students? Chances are it's already been done and for a small fee (or in a lot of cases for FREE), it can be yours to use in your classroom. Take back your nights and weekends, people! I am super excited to be joining up with some of the most amazing teacher bloggers and Teachers Pay Teachers sellers out there. 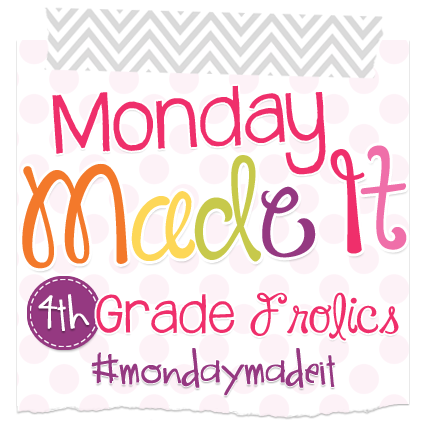 Our mission is to share ideas and resources specifically geared towards the middle grades. If people ask what you do for a living and you get responses like "Oh, bless your heart", "I could never do that" or "Are you nuts? 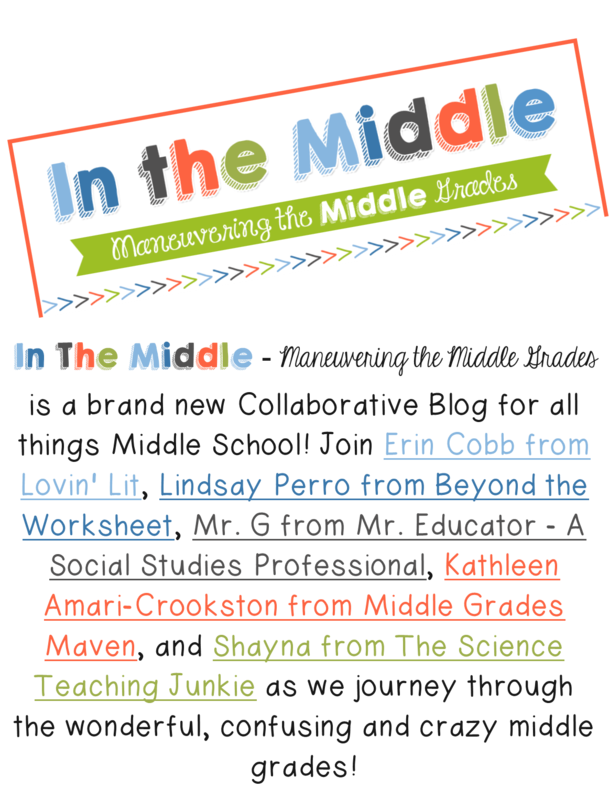 ", then you might be a middle grades teacher and this new blog just might be for you. Click on the image below to be taken directly to the new blog. It's definitely in it's beginning stages, but there are some helpful posts on the way and lots of information and resources that you don't want to miss out on. So, follow us on Bloglovin' and Facebook and start this collaborative journey with us. I can't wait to hear your feedback and ideas. If you have some topics you'd like to see covered in the future, please comment below. Throughout the year, I do A LOT of student groupings because I think (depending on the activity) students learn best when they are able to TALK about their learning. Sometimes I think learning would be most effective in partners, sometimes in small groups of 3-4, and sometimes alone. Either way, I wanted to have a system in place that would take care of these groupings without wasting precious class time. I've been using a Clock Partner or Cell Pals system to group students with one other partner that is easily glued into the Interactive Science Notebook, along with other creative partnering arrangements, such as Periodic Partners and Famous Trios. I've also had seat numbers at all of my lab tables to quickly give students new seating arrangements at the beginning of each grading period. And I needed a system to help me do a better job of randomizing and calling on students in a different manner, rather than the typical "raise your hand and I will call on you" system, which really isn't a system at all. Research has shown that teachers who use this method tend to call on the same student(s) over and over, while the "sleepers" never get called on. I want ALL of my students to be engaged in each and every lesson and paying attention because they never know when I may call on them. No more sleepers. 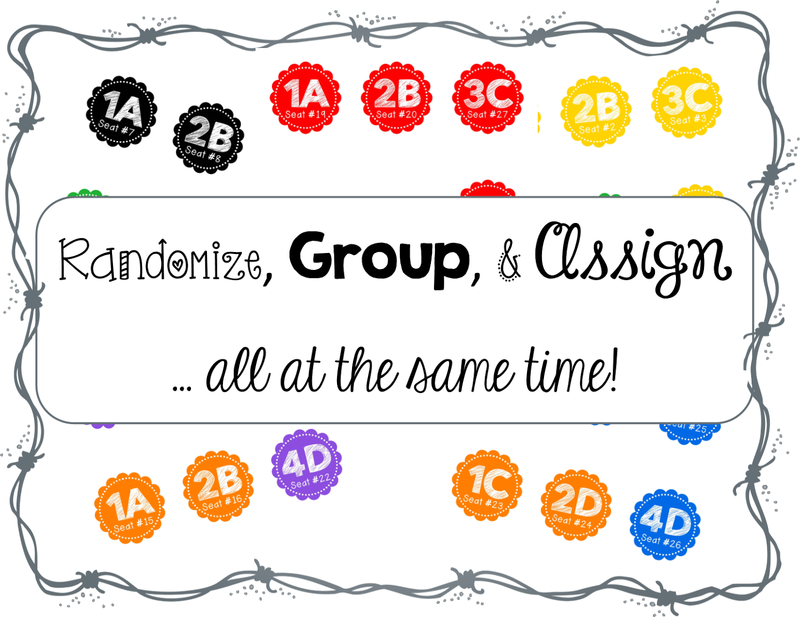 I wanted to create something that would incorporate ALL of these needs that I have in my classroom (randomizing, grouping and assigning seats and/or jobs). These seat labels come in 7 different colors (to coordinate with the primary colors I already use in my classroom to distinguish between class periods). 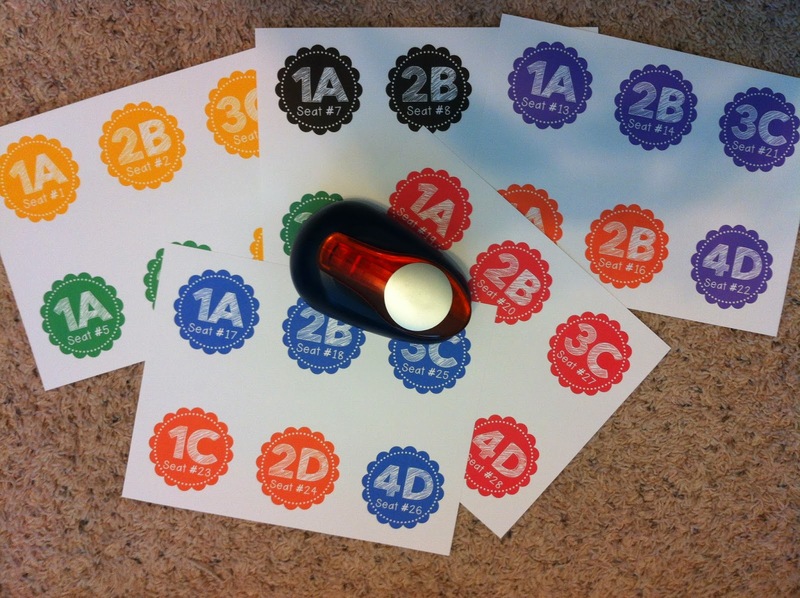 Each label has a color, number (1, 2, 3, 4), letter (A, B, C, D), and a seat number (1-28). My classroom is unique in that I have stationary lab tables with most tables seating up to 8 students. Not ideal, I know, but it's what I have to work with. First you need to decide what your typical "large group" would consist of and how it is laid out. For me, the largest group I typically use is 4 students (2 students on one side of the desk facing the other 2 students directly across from them). This large group of 4 gets the same colored desk tag (To group the students in the large group, I can simply say "All oranges work together. All greens work together."). I use contact paper to attach these to the lab tables. I try to put them in the location that I think will be least "messed with". After all, they are middle school students and they will stab these with pencils and try to pull them up all year. But with the exception of about 2 labels, they all stayed on the desk for the entire year this past school year. Within that group of 4, I can easily divide it into partners. For example, I can say "A's work with B's" and "C's work with D's". These are their shoulder partners. Or if I want them to work with the person sitting directly across from them, I can say "A's work with C's" and "B's work with D's". If we are conducting a lab investigation, I can assign each person to a specific job by saying "All A's collect lab equipment, all B's record data, all C's ...". For randomizing, I can ask all "B's" or all "4's" to stand up and they can answer a question or share their response for a particular lab conclusion question. When it's time to assign a new seating arrangement, I can just tell them a seat number (1-28), which is marked clearly at the bottom of each label. I love that there are so many options available all in one label. I can't wait to put this new system into effect this coming school year. 2014 TPT Conference - VEGAS BABY! This one's gonna be short and sweet... I am typing with one hand and it's driving me nuts. 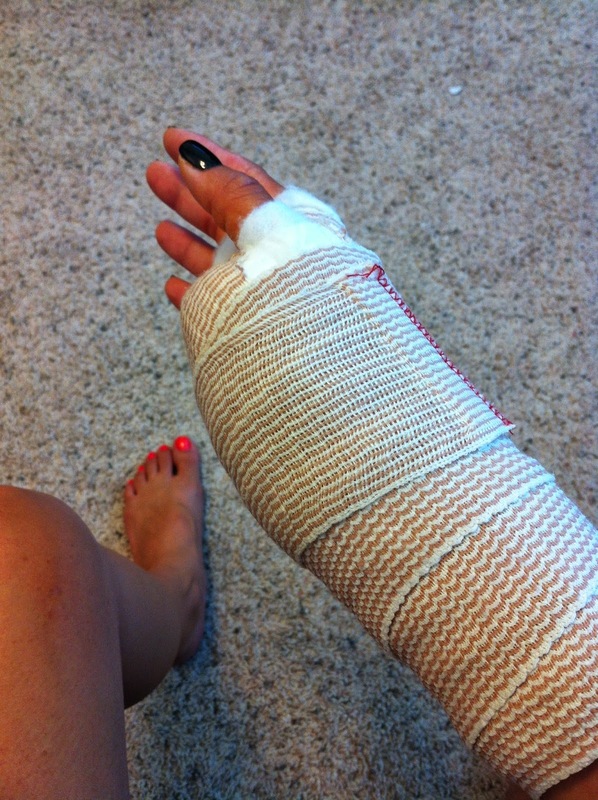 This lovely thing comes off tomorrow - just in time for the big Vegas Vacay! I am so pumped. (In case you're wondering, no-I did not beat my husband. No, I did not fall down. I actually chose to have this surgery.) After years of playing the flute, scooping Baskin-Robbins ice cream (first job), crafting, and typing non-stop, my carpal tunnel was just out of control and needed to be fixed. The bags are packed almost packed (who am I trying to kid), conference handouts printed, and the nerves are starting to kick in. Yes, I am a little nervous...I don't think I've ever gone to a big conference like this all alone (my hubby is traveling with me, but won't be attending the conference). 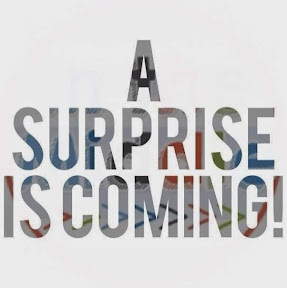 I am just eager to learn some new things from amazing teacher sellers from around the US and come back home to put those new ideas into place. I'll probably blog a little about the trip too, of course!